The question was once asked, "How, Master, do you sculpt an elephant from a block of stone?" And the answer came, "Simple, you chip away everything that doesn't look like an elephant." Two methods produce creation: one, subtractive; the other, additive. 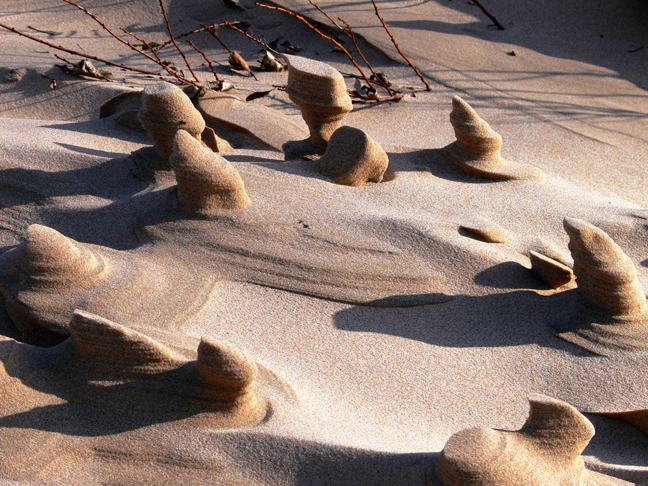 A sand dune is an example of the additive process. Wind blows each grain of sand up and over a crest in the shape of the earth until it falls to the other side, laying the foundation for more and more grains of sand to come. The resultant pile is a dune. These sand castles have resulted from the subtractive process. Water seeping amongst the grains of sand has frozen into clumps. Warmth from the sun then sublimates the moisture, releasing grains that can be born away by the wind. What remains is still bound by ice. As improbable as the resultant structures seem, no living agent is responsible.